The folks that peruse ToolGuyd are looking for tools that can pay for themselves, tools that work, and tools that won’t break the bank. Over the years, Spyderco has made a number of knives that fit that description, but no knife in their line up is a better value than the Spyderco Chaparral with a Fiberglass Reinforced Nylon handle. The Chaparral is a series of knives designed to be nicer everyday carry knives—gentleman’s carry. There were a trio of Chaparrals in titanium, one in carbon fiber, and one in a resin mesh combination called Raffir Noble. All were marked with great ergonomics and insanely thin blade stock. Coming in around 2.75 inches, Chaparrals were easy to carry, but still enough of a blade to handle a lot of different tasks. But these knives had handle materials that either made them expensive, less practical or both. Then, last year at the annual knife trade show Blade Spyderco showed off an FRN version of the great gentleman’s knife. The resulting knife is not just the best value in the Spyderco line up, it is the perfect line in the sand— spend any more than this on a knife and you are buying things unrelated to performance. The FRN Chaparral has a blade steel of CTS-XHP, an American-made powder metal steel produced by Carpenter. Known in the cutlery world as an excellent all around steel, when it was released XHP was called the perfect combination of 440C’s stain resistance and D2’s hardness and toughness. In the five or so years since, XHP has lived up to that billing. The Chaparral package is not just a nice size with a nice steel, it is a marvel of ergonomics (it is, after all, a Spyderco). The knife has a half and half finger choil, a notch designed as a rest for a person’s index finger. This choil gives you the ability to choke up on the blade, putting your fingers less than 1/4 of an inch from the cutting edge. The rest of the handle is well designed too. Finally, the knife sports a deep carry wire pocket clip, which not only holds and hides the knife well, it has very little negative impact on the knife’s grip. All of this is available for around $88. The knife will give you years of service provided you don’t abuse it and it will remain razor sharp for a very long time. Even more amazing, when Spyderco redid their pricing to implement MAP, the FRN Chaparral remained untouched. A good value before MAP, the Chaparral is the absolute pinnacle of value and quality now. If you want a superior tool for a decent price, you can’t do better than the FRN Chaparral. I’ve got this knife in frn for everyday carry and with raffir noble scales for dressier occasions. Great little knife for times a work knife like a pm2 isn’t needed. Spyderco is always expensive. It’s for Knife Guys and SERIOUS EDCers. I have a lot of serious respect for Spyderco, but I do more than just cutting things, so justifying the price of a Spyderco is kinda like trying to justify owning a Cadillac. THAT said, yeah… Honestly this one is really low on the Spyderco price scale. But, comparing a Spyderco to the sub-$50 market is like comparing an electric scooter to the Cadillac I mentioned earlier. A Scooter can get a disabled or elderly person from A-to-B very well. A Sub-$50 knife can get packages open, and cut rope very well. But a Scooter isn’t going to carry a spouse or child on a road trip if you choose to take one, and likewise a Sub-$50 knife is going to be made with materials that will not handle long term use without heavy maintenance. 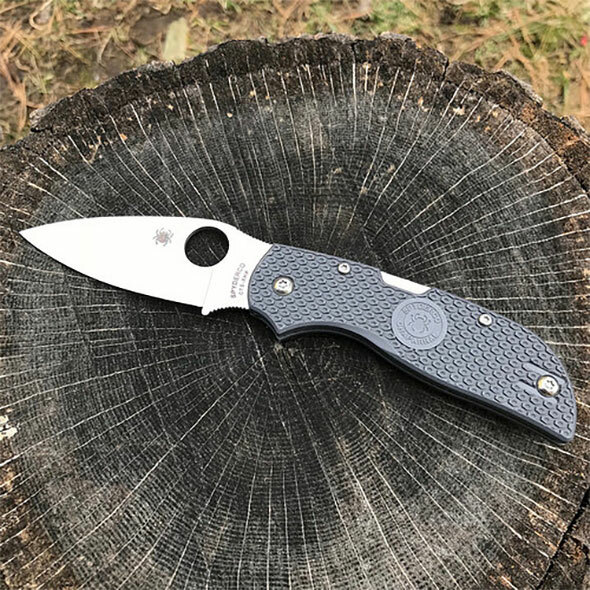 The level of strength that the Spyderco steel is using means it won’t have to be sharpened for MUCH longer than a cheaper knife might need. The spring lock that is used on either knife is also subject to stresses that may force the cheaper knife to become brittle, and loose. The Spyderco is more meant for those who do this stuff seriously, so it lasts longer, and you spend less time on maintenance. That’s where the price tag comes from. Spyderco might as well be a Katana made by a thousand year old sword making dynasty in Japan. The EDG, as you put it, isn’t going to order one. They aren’t thinking in these terms. The EDG need not apply for this kind of thing. But there is a giant market for these knives from Spyderco, from the Military, to people who own sailboats, or who teach specific trades, or any number of situations where they’re cutting things day-in, and day-out, just to enable them to do what they do. Even a descent model of Leatherman tool is of better quality than the Sub-$50 knife market, and they range from about this $80 range and up. My Wave was $80, and my Surge $120. Really, ANY level of quality or value comes in around this price range. It’s always an investment when it matters. ANOTHER GOOD ONE, ANTHONY! KEEP IT UP!! Not picking up what you’re putting down. I have the H2 salt, ergonomically as well as fit and finish can’t compare to Benchmade. Spyderco is over priced. Their cheap plastic handles feel like cheap plastic handles. Smoothness of operation is lacking. Lock back? Seriously? Makes a one handed knife two handed. I can’t understand why people are gaga over Spyderco. Waaaay over rated. What I like about Spyderco is that you can opt for basic handles, better handles, or more premium styles and materials. It’s like stepping up from a department store bike to a bike shop bike. 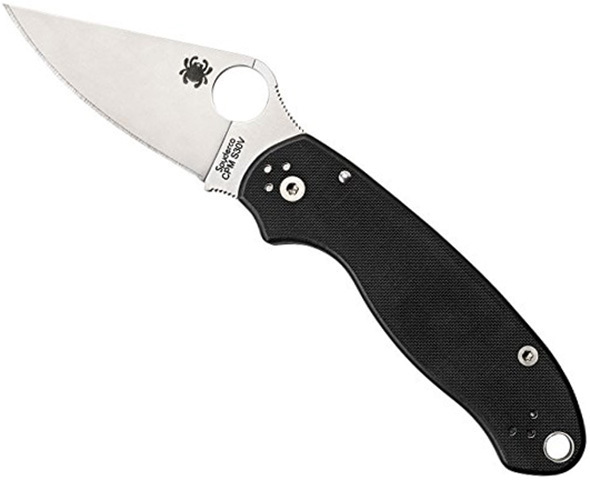 Spyderco also makes more basic knives, such as the Tenacious. I like those as beaters, but prefer some of their other knives for everyday carry and use. The spyderco hole is what enables one handed opening. It is pretty straight forward. I have never had a spyderco that I could not open one handed. One can make the same argument over DeWALT versus Milwaukee, then throw Rigid, Ryobi, and Makita into the debate as an attempt to call the Red and Yellow teams “Overpriced” for the same reasons. You aren’t “Wrong” about Spyderco being comparatively expensive. Far from it, they are definitely expensive. But, when you can choose the quality of the handle material, and find a specific design in their lineup that you can hold up with pride and say “This suits ME best”… you aren’t talking price anymore. You’re talking pride. One could say the same with the Benchmade knives. It stopped being about the money spent when you picked one that suited you best, all-encompassing of your personal conditions and requirements in life. These aren’t “Normal” knives we’re talking about here. Yes, the steel is special for Spyderco. Not having to sharpen it for a long time, despite heavy use, is where the expense comes in. But, y’know what? We can have that same dispute over DeWALT versus Milwaukee. The Plastic and Metal components in both are nearly identical. The shape, on the other hand, is completely different. The ergonomics of the DeWALT grips sell me, hands down, every single time. “But Ryobi/Rigid/Makita have really similar handles and grips, and are half the price!” True! But I can hold the DeWALT in my hand longer, and I don’t have to think about budgeting a replacement as often as I would fo Ryobi/Rigid/Makita. And if I’m arguing with myself over DeWALT versus Milwaukee, which tend to be in the same price range, within a slight margin, then I still go back to DeWALT’s Ergonomics. Milwaukee, at least for ME, don’t feel right in my hands. Spyderco versus Benchmade… Same argument. Benchmade can make a remarkably SIMILAR knife to Spyderco. It will ultimately come down to the individual’s preference here, but in neither of these cases is it as simple as “The Pointy End goes in the thing you want to cut.” They’re making a product that goes above and beyond just a simple sharpened strip of metal. If it truly was about the simplicity of using a pointy, sharpened object to do things, then there are prisoners world-wide that are making remarkable things out of wet toilet paper, and a broken off toothbrush that we’d be talking about as THE ONLY way to make these kinds of tools. Now, I’m not a Spyderco OR Benchmade spokesman, and I’m not going to any particular lengths to defend the expense here. But, I have to be honest in the fact that I’m NOT innocent here. For the sake of a KNIFE, I have spent significantly more than $50, and I fully understand what I’ve done in buying the way I have. It isn’t the same thing, obviously, but I chose Leatherman tools for my EDC, and they fall into the Spyderco price range. I can’t, in good conscience, say that spending this kind of money on THE TOOL that you truly want is NOT the right thing to do. It stops being about price, or doing what everyone else does. It’s about the INDIVIDUAL getting what they want, and choosing the up-scaled tool that suits them best. 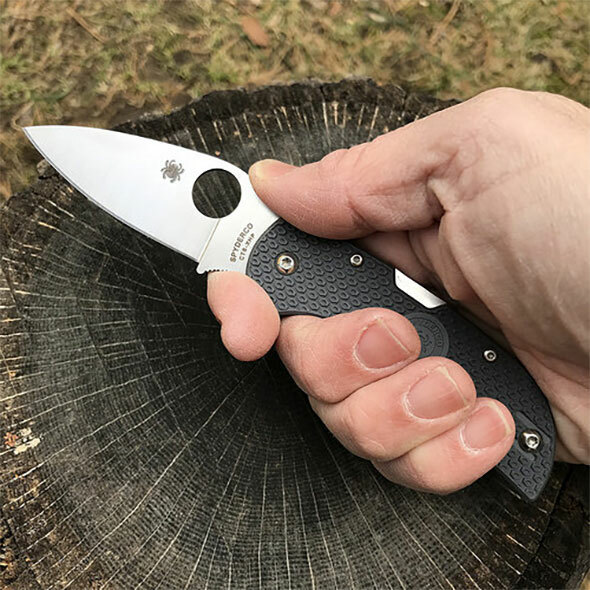 In the case of Spyderco, that extra large thumb hole, and the higher grade steel used, could mean the difference between make, or break, in an individual’s choice to step up from cheap, pointy metal object, to Go-To KNIFE for use in their Every Day Carry set. Sometimes it comes down to the size of your fingers, or something drastically mundane that changes the buyer’s mind. But if you’re stepping up from box cutter/pointy piece of metal, to reliable, made-to-last go-to knife in your life… Spyderco’s offerings are remarkably sensible for a remarkably large portion of people’s lives. I even know a Mom-of-3 whose job is as a Fire Safety Inspector, and SHE is a Spyderco customer. And she didn’t get some girly, pretty knife either. Hers rivals my two Leatherman tools on the scary scale any day. I don’t know what model she has, but she chose it for its serious application in being able to pry faulty wiring panels apart, just as easily as cut holes in walls to inspect damage, without skipping a beat. My Surge can do the same, but her Spyderco is so thin and flat that you can barely tell if or where she’s carrying it, and THAT is a terrifying thought compared to my Surge and Wave, that look like gun magazines on my belt. It all comes down to what you want out of that step up from box cutter/sharpened piece of metal phase, to serious EDC knife. Yep, pricey for me too. It looks like a lot of the cost is in the extra-fancy steel they are using. The new Milwaukee knives are nothing really special other than the D2 steel, and they cost about what this Chaparral does. Sooo compare in size to Delica vs. Dragonfly (my EDC) vs. Enduro, please? I am not a huge fan of the “lock” style (turned off on this via Boker from CC). The Delica has a slightly larger or “fuller” handle, in my opinion. Dragonfly is significantly smaller, or at least smaller-feeling. Endura, which I don’t think I have bought yet (if I did I lost track of it and haven’t carried it), is going to be quite a bit larger. A Google search can turn up plenty of size comparisons, but I can try to pull one together over the weekend if you’d like. 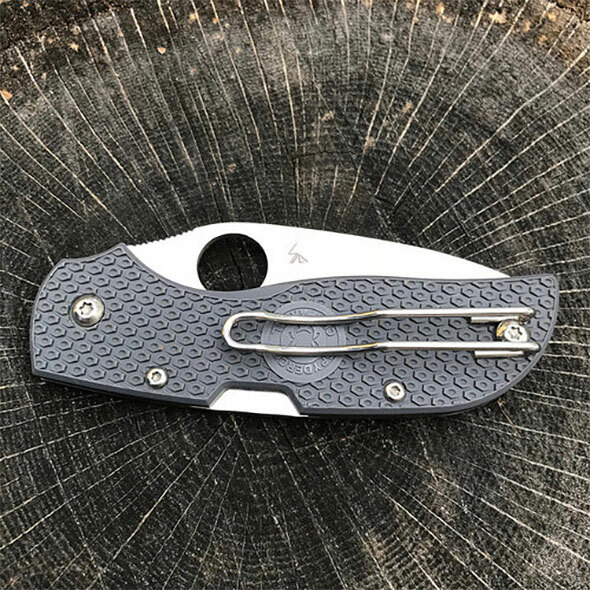 The Chaparral is a different style than the Delica, Dragonfly, and Endura. There’s also the Native, which is like a scaled-up Chaparral. Thank you Stuart, this is the information I am looking for!!!! Dont know if I’d like that style pocket clip. Do you think it will be durable? There were some cheap Chinese knives posted earlier. I wonder if TG will ever look at knives by Byrd, Spyderco’s value line (made in China.) They have pretty ordinary steel, but the overall design is very Spyderco, so if you like the handle shape, lock action, etc., then you should like Byrd. Maybe 1/3 the price, but with ordinary steels. I love my byrd cara cara rescue with a serrated edge. It’s a beast when it comes to lawn maintenance and light pruning and gardening. I have always shied away from the Byrd line, but we can take a look at them if there’s strong interest. I’ve spent enough to own a slysz bowie but still have respect for the byrd cara cara rescue enough to own 2 if that means anything. The lockup is nice and tight with no blade play on my 2 examples and they seem to do a good job with the heat treat to get the most out of the 8cr13mov. Byrd is worth your time for a review compared to other sub $50 to $75 imported knives. I don’t have any experience with them (which is why I would like to know more.) I became much more interested in them after they switched to a flat grind like the Chaparral has. It makes the knife less robust but a better slicer. But it takes more time and wastes more material than some other grinds, so I’d imagine it increases the manufacturing costs. According to EveryDayCommentary, the Chapparel is one of the best slicers; other top rated slicing knifes include the TRM Viator and Spyderco Dragonfly II in ZDP-189. Another great review, thanks Tony. And thank you Stuart for bringing Tony onboard, its great to have the perspective of an expert on what is for me (and I’m sure many others) is our most-used tool throughout the day.